[[underline]]THE KEYHOLE COMMITTEE[[end underline]] The Keyhole Committee of the University of Iowa sponsored visitations from two cities in Iowa last semester. The first visitation was from the Tama Settlement to the campus for two days. Among various recreational and social activities, such as bowling, billiards, and a party at the CIASU in their honor, the students roured the campus, visited classes, and talked with members of the Chicano-Indian American Cultural Center. During their stay, the students dined with Ms. Rusty Barcelo, Associate Director of Special Support Services, and Norris Batts, who represented the Admissions Office here at the University. The second visitation that the Keyhole Committee hosted was a group of Chicano seniors from the Des Moines area, representing Lincoln, East, and Technical high schools. During their one-day visitation here on campus, they visited different classes, took a tour of the campus, and consulted with members of the CIASU. Also, Ms. Rusty Barcelo dined with the students int he evening and was available for any questions or comments. In the future, the Keyhole Committee will be hosting high school students from high schools in areas such as Fort Madison, Burlington, Sioux City, Waterloo and Davenport. RECRUITING Approximately 29 applications have been received for the 73-74 academic year. Presently plans are being made for follow up contacts with students who have indicated a desire to apply at the University of Iowa. 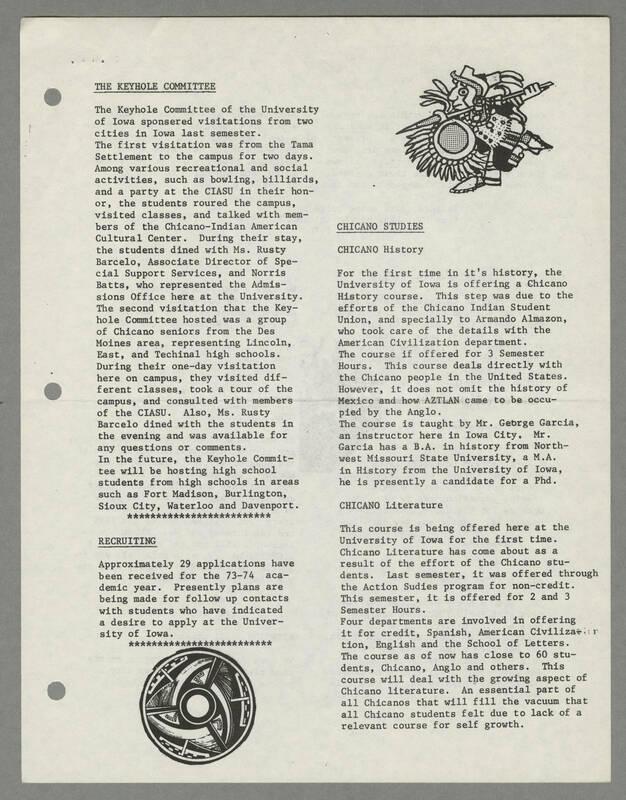 [[underline]]CHICANO STUDIES[[end underline]] CHICANO History For the first time in it's history, the University of Iowa is offering a Chicano History course. This step was due to the efforts of the Chicano Indian Student Union, and specially to Armando Almazon, who took care of the details with the American Civilization department. The course if offered for 3 Semester Hours. This course deals directly with the Chicano people in the United States. However, it does not omit the history of Mexico and how AZTLAN came to be occupied by the Anglo. The course is taught by Mr. George Garcia, an instructor here in Iowa city. Mr. Garcia has a B.A. in history from Northwest Missouri State University, a M.A. in History from the University of Iowa, he is presently a candidate for a Phd. CHICANO Literature This course is being offered here at the University of Iowa for the first time. Chicano Literature has come about as a result of the effort of the Chicano students. Last semester, it was offered through the Action Studies program for non-credit. This semester, it is offered for 2 and 3 Semester Hours. Four departments are involved in offering it for credit, Spanish, American Civilization, English and the School of Letters. The course as of now has close to 60 students, Chicano, Anglo and others. This course will deal with the growing aspect of Chicano literature. An essential part of all Chicanos that will fill the vacuum that all Chicano students felt due to lack of a relevant course for self growth.